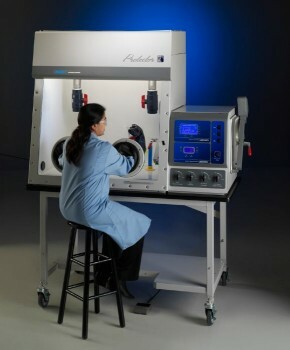 These glove boxes provide inlet and outlet HEPA or ULPA filtration and a leak-tight physical barrier to protect the operator from exposure to potentially hazardous materials and perform work with contamination-sensitive materials under vacuum or in an inert environment. Additionally, they feature two internal valves to convert the glove box from a flow-through filtered box to an inert atmosphere glove box. Please, contact us for more information on glove boxes.